This week is National Infertility Awareness Week. Which is nice in its sentiment, but for those of us walking through the wild wilderness of infertility, we’re aware every single pulse and breath of every single second. Always, always, always aware. Mother’s Day is in 11 days. I expected to be nearly a mother of two this Mother’s Day. My would-be-due-date is in 21 days. And the last 9 months of loss have torturously echoed a pregnancy. In the first “trimester” of loss, I felt terrible, like I would never feel like myself again. A few months passed, and I felt nearly normal in the second “trimester” of this wasn’t-meant-t0-be pregnancy. I felt more alive than I did in those early days. I thought that maybe I was over the hump. But here I am nestled in the third “trimester” now, anxiously watching my due date creep into view, and I’m painfully aware of the labor that will deliver nothing on that day. I’m uncomfortable and miserable and wondering who else can see me wiggling in my misery of what isn’t. I thought I would be expecting again by my due date. Instead, we’re in the roiling throes of several failed fertility treatments, and each one feels like a loss on its own, only serving to underscore the initial loss. It isn’t just bleeding. It’s saying goodbye to that potential. It’s bidding adieu to another possible life. It’s saying hello to another gap in my heart. And it’s another rep of searching for the hope. Each time it’s harder. I feel like I’m maxed out on my weight and my reps, and there are no #gains in sight. I don’t want to be this person lost in the oh-so-capital-f-f-f of my Feelings. I’m sitting at a cafe table now trying to escape the suffocating weariness that has grown like kudzu around the beating hope of my heart. I didn’t expect hope to be hard. Scripture says it’s the anchor of my soul, firm and secure. You know what else anchors are? They are heavy. And the hope feels heavy right now. It feels impossible thinking about hoisting it up on my boat deck another time and sailing joyfully into the unknown. Hope feels like a trap when you’re treading in the depths, doesn’t it? A lifeboat with a hole in it… maybe you’ll get to shore before you sink. And maybe you won’t. Thanks, hope. That’s what my feelings tell me anyway. Those tricky minx of instability, insecurity, doubt and fear. I hate them, much more than I hate the perceived burden of hope, because they steer me right into the rocks every time I allow them to be the rudder of the ship. You know what anchors are? They are useful. They are sure. They are constant. They settle securely in the banks of the murky, swirling depths, and they stay there. They plunge through the seas and the swelling tides of my feelings, and they plant me above the waters. They dive deeper than I can. They hold firm when I would be flailing and losing breath. I was word vomiting on my mom this morning, and she sagely chatted me this, “We hope, but He IS hope. SO, we know His plans are true, faithful, and better… but we human-hope that He will do it our way because then our feelings are more manageable.” Yes. This. Hope isn’t fleeting the way our emotions are fleeting. In my pain, it’s the fatigue and the hurt that feel constant, and the hope that feels transient. But that simply isn’t true, because He isn’t transient. He isn’t some gypsy wandering about who occasionally camps in my yard. Earlier this week Nora Beth and I were having our daily playtime in the park. 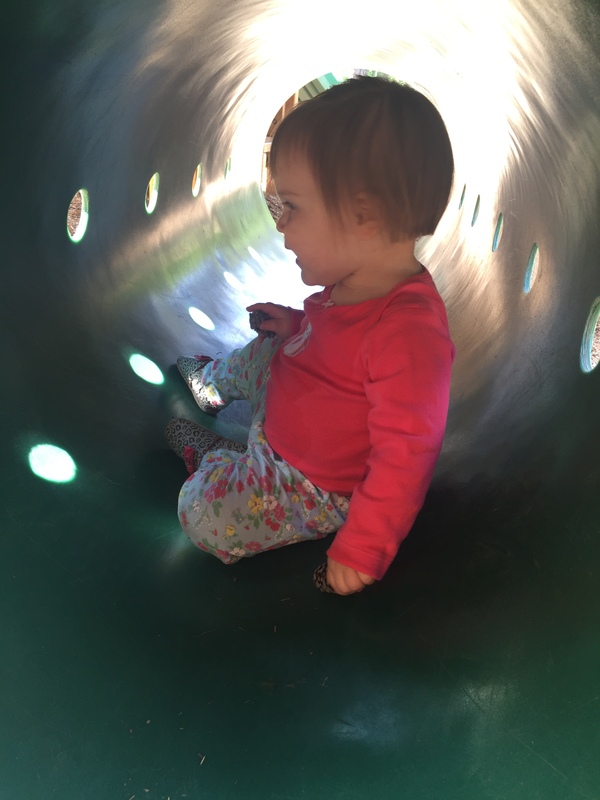 She set off through her typical tunnel and stopped in the middle. She wouldn’t turn around, and she wouldn’t move forward. She sat there, with light beckoning her from either end. Instead she pressed her face up to the little hole in the middle of the tunnel and squealed, “PEEP EYE!” Our pain is the tunnel. And the great thing about the hope… even when it’s hard, is that there isn’t just an entrance and an exit – there isn’t a linear voyage – hope offers windows of light throughout our journey. Even when it’s hard. Especially when it’s hard. Peep eye, hope. I see you.